MANILA, Philippines - Rapper Psy will be awarded the Order of Cultural Merit award by South Korea for his contribution to spreading hallyu, or Korean wave, through his hit song "Gangnam Style." The announcement was made by Korea's Ministry of Culture, Sports and Tourism, which will bestow the award on Psy and nine other personalities. 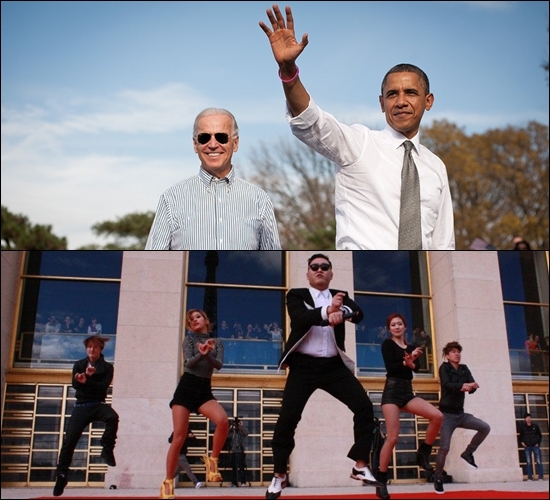 US President Barack Obama (top photo) and Psy (bottom) in Paris. Other awardees are director Kim Ki-duk and stars Lee Jung-jin and Jo Min-su, who all worked in the film "Pieta" (which won in the Venice Film Festival), drama writer Kim Soo Hyun, TV actress Na Moon-hee, singer Song Chang-shik, singer Geum Sa Hyang, actor Yoon Il Bong and director Song Seung Hwan. Psy will receive the Ok-gwan medal, the fourth highest Order of Cultural Merit award. He is being recognized for increasing the interest in Korea and K-pop music through "Gangnam Style," which has become a massive global hit, accumulating 661 million views on YouTube to date. The song is No. 2 on Billboard Hot 100 chart for six consecutive weeks and Psy is hoping that it will reach the top spot. Last Nov. 5, Psy performed before 20,000 people in Paris, France, leading the "Gangnam Style" flash mob at the Trocadero Square near the Eiffel Tower, organized by radio host Cauet of French station NRJ. "Spending my last night in Paris...It was a short but passionate stay!!! Plz remember what I told you at the flashmob. #PSYinPARIS2013," Psy tweeted on Nov. 7. Even US President Barack Obama has watched "Gangnam Style" and said that he can do the horse-riding dance. Billboard said President Obama was asked about "Gangnam Style" during a radio interview in New Hampshire. "I just saw that video for the first time. I think I can do that move," President Obama was quoted as saying. Asked if he's going to dance "Gangnam Style" if he is reelected as president, President Obama said he would probably do it privately for his wife, First Lady Michelle Obama. "I'm not sure that the inauguration ball is the appropriate time to break that out. Maybe do it privately for Michelle," President Obama said.